They're Hinds, and they came here to rock. There are many great nights to play a gig in the city of Newcastle, but 9:00pm on a bitterly cold Tuesday evening - at a venue adjacent to the River Tyne - is not one of them. Add to that the uninspiring darkness of winter and the inevitable school-night lethargy, and it’d be safe to say the deck was a little stacked against Hinds at the Riverside on December 4th. But if there’s one thing the Newcastle faithful are partial to, it’s a good underdog story. While temperatures outside of the gig may have been sub-zero, inside the Riverside was a very different climate. The numbers had perhaps slightly dwindled, but fans who’d made it to the gig managed to provide a welcome humidity and warm embrace for the Spanish four-piece as they awkwardly, almost cautiously made their way onto the stage. At first glance, you’d be forgiven for thinking this wasn’t a band at all. 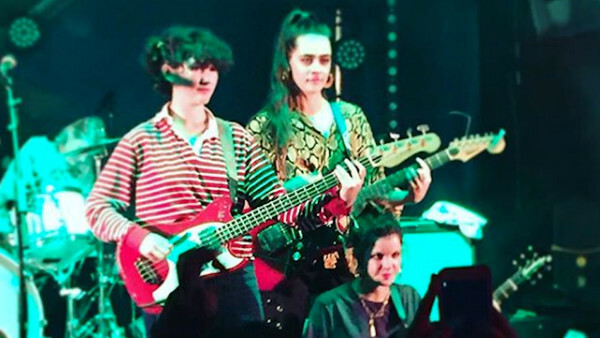 The four las mujeres from Madrid couldn’t have embodied their lo-fi, garage rock moniker anymore if they tried - hair up, dressed down, holding their instruments like someone had just handed them a tennis racquet and asked them to beat Rafael Nadal on centre court. That feeling was only heightened when technical difficulties and a few snapped guitar strings marred the start of the show. And yet, despite all of this, not a single person looked worried, nor were they phased by it, and therein lies the charm of this band. Hinds are quirky, they’re last-minute, they’re unconventional, but it’s this nonchalant, try-soft nature that makes them so impossibly godd*mn loveable. Stringing together adorably apologetic Spanglish sentences, guitarist and co-lead vocalist Carlotta Cosials quietly and coyly muttered sorries into her microphone, as vocal partner Ana Perrote smiled and joked her way through sorting a snapped guitar string. Admittedly, the crowd were quiet, something you could tell the band were feeling conscious about, but it certainly wasn’t a reflection on them. Either way, Hinds weren’t about to let that deter them, and pretty soon they were on their way, making up for lost time by gliding through songs like ’Linda’, ‘Soberland’ and ‘British Mind’, slowly loosening up the northern crowd track-by-track. Although the evening’s vibe was one of lush, mellow happiness, you could tell the Spanish quartert preferred - and were perhaps used to - a much bigger, bolder atmosphere, and weren’t just satisfied to keep things at that level. While the fans had remained fairly sedate throughout, it became apparent that if the punters weren’t going to give their unreserved energy willingly, then Hinds were going to take it. And take it they did, with a knowing smile to boot. Dripping in charisma, with a passion and poise that somehow managed to say ‘we don’t give a f*ck’, but also ‘we give the biggest of f*cks’ all in one, Hinds found their turning point, ripping into ‘Tester’ and completely transforming the atmosphere in the Riverside. Whether it was the fervent facial expressions from Ana Perrote, Amber Grimbergen thrashing her drum kit like it stole her lunch money, Ade Martín’s bone-tingling bass or the intoxicating way that words seem to swirl off Carlotta Cosial’s lips, these four Queens were taking over the night, and nobody could stop them. The sign behind them read ‘Hi, We’re Hinds - We Came Here To Rock’, and they weren’t bloody kidding. From there, the crowd were hooked, and the Spanish señoritas turned the gig into their own personal punk rock party. Following that up with a killer rendition of The Clash’s ‘Spanish Bombs’ - as well as hits ‘Rookie’ and ‘Finally Floating’ - singers Perrote and Cosials both took it upon themselves to get into the crowd and sing with the fans, with the latter making it all the way onto the bar at one point. Whoever said rock and roll was dead has obviously never met Hinds. All of a sudden, a once sedate support at the Riverside were bellowing for their encore, desperate to get one more tune from Madrid’s finest exports. Hinds obliged, blasting out their final songs before giving a heartfelt farewell to their Geordie fanbase. This would be their last stop of seventeen in the UK, and amongst showering both the great city of Newcastle - and the United Kingdom in general - with love and affection, Perrote told fans the thing they were going to miss the most was Wetherspoons. Because of course they were.